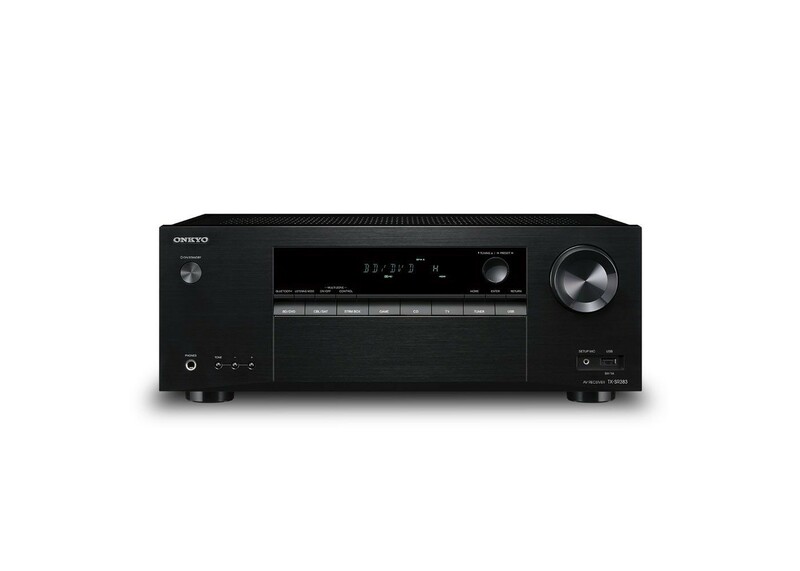 Invest in class-beating surround-sound rather than features you mightn’t need with the Onkyo TX-SR383. Seven discrete analog amps powered by a high-output transformer let you connect Front Height or Rear Surround speakers, expanding to a 7.2-channel layout. Experience native high-resolution 7.1 DTS-HD Master Audio and 7.1 Dolby TrueHD soundtracks from Blu-ray Disc and more, while AccuEQ-calibrated speakers assure clear and accurate imaging. Got spare stereo speakers? Connect them to dedicated Powered Zone 2 speaker outputs to enjoy selected audio sources available to the receiver, including analog, AM/FM tuner, and Bluetooth audio, in another room. Play a source in Zone 1 (Main) or Zone 2, synchronize audio playback in both rooms, or play a different audio source in each zone at the same time. Going multi-room is simple, all while retaining a 5.2-channel home theater. Enjoy bit-perfect high-resolution movie and game soundtracks through your surround speaker system. The TX-SR383 decodes Dolby TrueHD and DTS-HD Master Audio formats common to Blu-ray Disc and selected video streaming services. Enhance immersion with Front Height or Surround Back speakers for playback of native or upmixed 7.1-channel movie soundtracks. Connect all your media players to the TV with one cable for neat installation. Four HDMI terminals pass the latest video formats to your compatible display, including 4K/60 Hz, HDR10, HLG, BT.2020, and premium HDCP 2.2-protected content. Output terminal supports Audio Return Channel (ARC) for amplification of TV broadcasts when the receiver is connected to an ARC-ready display. Customized transformer delivers high current instantaneously via discrete analog amps to the speakers for thrilling surround-sound performance. With high power, precise control, and low distortion, film soundtracks wrap seamlessly around your audience, while stereo music brims with energy and zest. Bluetooth wireless technology beams whatever’s playing on your mobile device, laptop, or PC to your home theater. Devices* supporting the apt codec enable CD-like lossless playback. AccuEQ sets speaker parameters such as distance, output, and crossover, and then EQs to present the audio image free from distortion caused by your room acoustics. Just plug in the setup mic after connecting your speakers, follow the on-screen prompts, and enjoy automatically calibrated theater sound. Lossy files such as MP3 are convenient. However, signal data lost in the compression process results in comparatively low fidelity when played through a quality amp and speakers. Advanced Music Optimizer technology developed by Onkyo restores lost information for objectively better sound with these file types. Touch a key on the remote to enable Advanced Music Optimizer mode on a variety of input sources, including audio via Bluetooth technology and USB input. A 5V /1A rear-panel terminal supplies power to selected HDMI media streaming devices, allowing you to affordably upgrade your home theater with on-demand network entertainment simply by adding one of these devices. Connect a USB flash-memory device filled with MP3, WMA, and AAC files to the receiver’s front USB input and use the remote and TV display to easily find and play your albums. Advanced Music Optimizer enriches playback quality of compressed audio files. Connections to your speakers and media players are clearly labeled and illustrated on the rear panel—the connection diagram is also readable upside down to make things easy if you’re leaning over the top of the receiver.